do I care to serve myself most of the time in relation to others? or, do I care to serve others faithfully more than half the time? I know why we are here, but I do not know if this is the best of all possible worlds ~ it very well might be. I do not even know whether there is a deeper reason or motive that underlies the reason I know. All I know is that we are here to walk a tightrope of care the best way we know how. 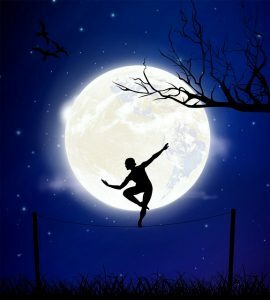 I walk my tightrope of care by being present to whatever arises in the moment (presence), by caring enough to know myself and my perceived limits (promise), and by moving with grace and ease around or through whatever perceived obstacles or limits arise in the moment (power). My ultimate question is also my ultimate challenge: with presence, promise, and power, will I even make the attempt to grow and flow through life, or keep growing and flowing through life, with grace and ease along a tightrope of care? Metaphorically speaking, if it gets too hot or cold for me, can I nevertheless move with grace and ease? If it gets too bright or dark for me to move, can I nevertheless stop to find my balance? And if it gets too breezy for me to move, can I nevertheless stop and keep the balance? In the face of any lack of facility on the tightrope of care, can I assume at least a little responsibility for the fact that I had a hand in bringing it about? And can I care enough to extend a hand in bringing it around? Where moving with grace and ease along the tightrope of care is not possible, or not yet possible, can I nevertheless find every opportunity to walk the tightrope of care patiently, diligently, and persistently? And if I should lose my balance and take a fall, will I nevertheless bounce back up for another go? In the overall scheme of things, walking a tightrope of care requires a photographic lens-like attention to detail in balance with the big picture, while keeping the balance between inward focus and outward focus. To be sure, this is no small feat, even for the most proficient among us. Speaking of the big picture, what is the big picture that surrounds your tightrope of care? Truth be told, there are as many tightropes of care as there are fleeting glimpses of the big pictures that surround them. In my writing of Alone in Paradise: How I Came to Know My Depths in Paradise, I walked a tightrope of care that I found gratifying for me to walk, in which I gracefully and easily invested the heart of my soul, while not knowing when or how it would end until I was close to the end. In walking this tightrope of care, I found myself being pulled into a process of worshipful living, a process that involved risk even as it continued to evolve into processing scenarios of risk. In the light of this deeply and divinely inspired passage of insight, Alone in Paradise: How I Came to Know My Depths in Paradise was for me a subjective and subjectively truthful journey that weaved philosophical, psychological, religious, and spiritual insight into a fictional narrative. The illusion, so-called, that is referenced in this passage is the illusion of this world as an incubator that offers a bridge and a mirror for learning and growing. In writing Alone in Paradise, I created an illusion within an illusion so as to better negotiate and navigate the greater illusion. Alone in Paradise is also my claim of right to explore, approach, and express a realization of ultimate fulfillment for my deepest, most heartfelt desires; it is at once a fictional memoir, an interior spiritual journey, and a rich metaphor of how I would actually live and love my life on Earth. In writing Alone in Paradise, I came to understand that going and growing with the flowing, in or out of a fictional narrative, is mostly about seeking, finding, seeking, and finding a metaphysical adventure along a tightrope of care of my own design, one whose essence can be shared and compared in any moment, moment to moment, for the benefit of anyone open to the caring that this sharing represents.